Pain or disruption in free mobility can often be frustrating. Cuff tear is one such orthopaedic condition which hinder with free movement of arms. A rotator cuff is a group of four tendons and muscles that help in the stabilisation of shoulder while helping in rotating and lifting of arms. 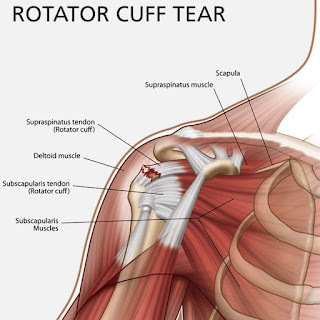 Cuff tear injuries that occur in the rotator cuffs are common in sports persons, due to repeated wear and tear. Rotator cuff tear can also occur while lifting heavy things or falling on the side. They can be painful and interfere with our daily activities. Rotator cuff tear can occur due to poor sync between the shoulder blades and shoulder, poor postures, bone spurs, repetitive stress to shoulders, lack of adequate blood supply, keeping the arms in same position while sleeping and so on. Cuff tear can be diagnosed through physical examination of the shoulder or through diagnostic techniques like ultrasound, X-rays or MRI. Moderate cases of rotator cuff tears can be treated with a combination of medications and physical therapy. The medications include anti-inflammatory drugs to control pain and swellings in the shoulder. The physical therapy procedures help in strengthening the shoulder muscles. In cases where the cuff tear cannot be cured with medications alone, surgeries are done. Arthroscopy is the commonly preferred surgery done for treating cuff tear. The procedure is done by inserting an arthroscope through small incisions created at the site of injury. An arthroscope consists of a tiny tube affixed with a camera and other instruments required for the conduct of the surgery. A minimally invasive procedure, arthroscopy ensures best results with a short recovery period. Dr Bharani Kumar Dayanandam is a leading orthopaedic surgeon who provides best shoulder Pain Treatment in Chennai with the help of a dedicated team. Thank You For Sharing us with a great blog! I really impressed after red this is such helpful information about knee with us and I hope you will share some more information about knee and all details of knee and its types. Please keep sharing.